Tonight we have quite a special event in the sky, and I hope everyone gets a chance to see The Super Blood Wolf Moon. The Blood moon part, although long prophesied biblical precursor for the end of times, naturally has a much less sinister genesis, the blood moon is called that because of the red ring that results when the earth is directly between the Sun and the Moon, and the earth casts a shadow on the moon. The Wolf moon was originally called that after tales of wolves howling outside villages in the winter when food is scarce and they’re hungry and hunting, and the Super part is because the moon is closer to the earth than normal, so it appears larger. Full moons always enhance energy, but this month especially, you will want to be careful. Everything combines to increase the energy of the full moon and can affect our own energy as well. This is wonderful when you are focused and know exactly what you want. Unfocused magic, on the other hand, can bring unplanned and unwanted results on any moon, and especially so on the full moon. If you choose to do a spell of some sort, make sure your focus is sure, and you know exactly what you want to accomplish. There are many ways to celebrate the moon, of course. This time of year, I sometimes like to do a simple ceremony to let go of those things that no longer serve me and welcome the energy of the new year. The hard part here for me is taking the time to sit down and is that you must take time to sit down and really think about what you want to let go of, and how to effectively put it behind you. Once we know what’s blocking us, it’s easier to remove the blocks. You can make this as involved or as simple as you would like. I’ve done it several ways. Always make sure to cleanse, and since energy is intensified by the full moon, make sure you cleanse well to keep negative energy out of your space. Write down all the things you want to let go of. I use a small piece of paper for each. Even a post-it will do. I use black and white candles because those are two of the colors associated with this full moon but use what works for you. In general, if you use the black and white, the black is for letting go, and the white is for welcoming the new. Many people carve a word or two on each candle to represent the letting go and welcoming in. 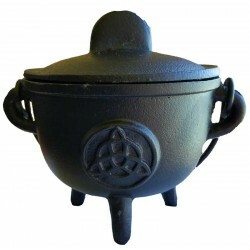 Build a small fire in your cauldron, (you can also use a votive for this) or another fire safe container. I include things that represent what I’m letting go and some that represent what I want for the new year. For me, that’s usually stones because with stones use stones for these, and just change them out for the various parts of the ritual or just group them around the cauldron and the candles accordingly. If for whatever reason, you choose to keep the items you’re using to represent what you’re letting go, make sure they are washable so you can clean them with your full moon water and under the moon itself after your ritual. Anoint your items with oil, and some of my favorites to use for this are Peppermint, Frankincense, Bergamot, and Orange Blossom. 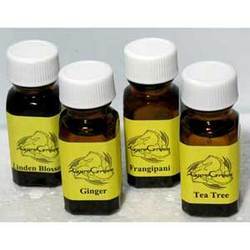 These are all transition oils, so choose for your personal goals. I leave the past behind. Take a moment and say a final goodbye to the things you’re letting go. With this fire, I release the past and the things that no longer serve me. When you are done, make sure there is nothing left but ash of the negativity you let go, and change your stones. Welcome to the energy of the new year. I have released the old and cleared the way to welcome the positive energy of the new. Take time to think about those possibilities and absorb the energies of the moon. When you close your circle, make sure to cleanse your cauldron with the moon water to wash away the ashes of the negative things you let go.